Who is Negan, really? Before being introduced in the Season 6 finale of The Walking Dead, Negan was an extremely popular character in the comic books upon which the show is based. But up until now, fans haven't really gotten to hear his backstory. A new prequel comic changes all that. And the first four pages of this release finally reveal what Negan was up to before he started bashing in heads with his trusty baseball bat Lucille. Many speculated that Negan was a used car salesman. But that's not his chosen profession at all. He's actually a former school teacher and ex-ping-pong coach. Though, he still had a taste for salty language before the end of the world rained down upon humanity. 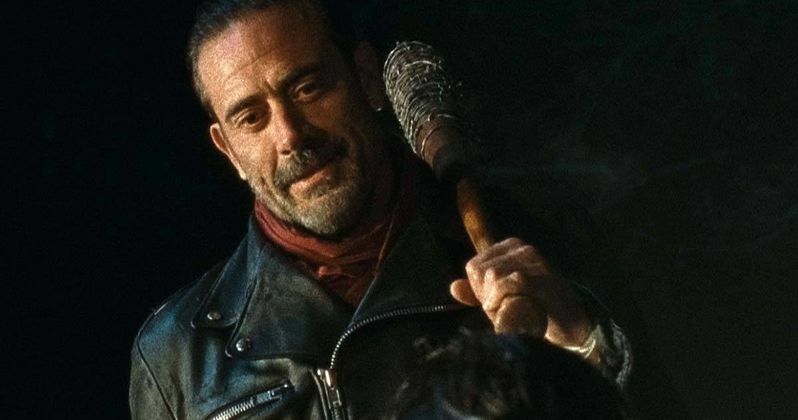 The Walking Dead Season 6 spent its second half building up to Negan's big reveal. The character is played to perfection by Jeffrey Dean Morgan, though many fans were disappointed that his arrival ended on a cliffhanger. For months, viewers were promised that this nasty man was going to claim the life of one Alexandria resident. That, he did. But it was only shown from the POV of Negan's victim. And we'll have to wait until the Season 7 premiere to discover who was on the receiving end of that death blow. In the interim, a new Walking Dead one-off comic is being released that finally delves into the backstory of what some consider the greatest comic book villain of all time. The prequel is only being released in four-page increments, with the very first page released earlier this month. The comic is 48-pages in length, which means it will take a full year to tell this tale. But the story doesn't wait very long before explaining more about who Negan was. These first four pages of Here's Negan show the gruff teacher coaching a few kids at the ping-pong table, helping them perfect their skills. The pages aren't available online yet, but thanks to ComicBook.com, we known that Negan goes onto verbally berate and humiliate one student, shouting his trademark obscenities and dropping a few sexual references. Negan goes on to win this round of ping-pong. These first four pages also show that Negan has a special lady in his life. At this point in the show, it has not yet been revealed if the TV version of Negan has a girlfriend or wife. It's likely that this new female character being introduced in the prequel comic is already dead in the currently timeline of the show, but that hasn't been revealed just yet. It isn't known how these new character details and plot developments will be utilized on the show. Shortly after Negan's lady friend makes her entrance, she has a seizure and looses her footing. We won't learn more about this until the next four pages are released in May. The Walking Dead returns for Season 7 this fall, though an exact premiere date has not been announced. If you want to check out these first four pages of Here's Negan, they are available at your local comic book shop as part of the Image+ preview magazine. Hopefully we'll get to see Negan play some ping-ping early on in the new episodes. Possibly against Rick. How cool would that be?